will be presented at the Second Annual CoNECD Conference on April 15, 2019 in Arlington, VA. 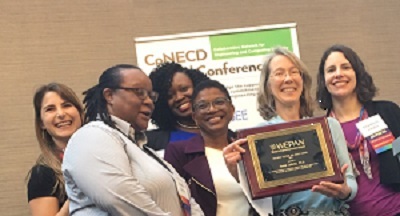 The Collaborative Network for Engineering and Computing Diversity (CoNECD) is a collaborative effort of: NAMEPA, WEPAN, ASEE MIND & WIED. Nominations for the 2019 WEPAN Awards has closed as of March 1, 2019 5:00 PM ET. honor key individuals, programs, and corporations for accomplishments that underscore WEPAN's mission. To learn more about each award, access nomination forms, or to view a list of past recipients, please click on the appropriate links below.